As a woman working in the imaging field, I was thrilled when the Food and Drug Administration proposed new rules related to how patients are notified of their breast density. I’ve seen firsthand the benefits of breast density testing and its impact on long-term patient wellbeing. In March 2019, the FDA released its proposal, something that women’s health advocates eagerly awaited since the federal funding law was passed back in mid-February. At the time, much of the media focus was on the political implications of reopening the government, but when healthcare experts really dug in, they discovered one exciting breakthrough within the legislation, which opened the doors for an update to the Mammography Quality Standards Act of 1992. This means more than 25 years have passed since we’ve updated the pre-eminent safety mandate that governs one of the most important exams women will go through regularly throughout their lives. Back in February, the law clarified that the FDA would update the language to reflect the increasingly understood correlation between dense breast tissue and incidence of cancer. The FDA rule is now available, and it provides guidance for how providers should approach breast density notification. Let’s take a look at the main changes brought about by the FDA’s proposal (which, it should be noted, is up for comment for 90 days and could see revisions by the time it’s finalized). The biggest change from the new proposed rule is how the patient is informed about her breast density. Right now, states have a variety of different rules regarding notification (see below for more info). The FDA seeks to bring this type of notification to the national level by requiring providers to, in their summation of test results, tell patients in relatively straightforward language what their level of density is and what it means. This will require a brief explanation about breast density and its correlation with cancer, as well as information specific to patients with dense breast tissue. For those patients, there would be the results of the test itself, as well as further recommendations about speaking with providers. Another aspect of the rule is the way that providers themselves receive notification. A new category, “known biopsy proven malignancy,” is being added for the assessment stage of the process. Finally, the FDA is seeking to ensure facilities are compliant and that patients are empowered to learn more information about facilities that are not compliant. This will be accomplished by the FDA permitting itself to tell local providers and patients if a given mammography facility did not test for density or provide information on density to the patient. Within this notification, the FDA may recommend these patients seek additional testing elsewhere. Basically, if facilities don’t meet the new standards, patients will have an opportunity to go elsewhere for more accurate testing. Moreover, it allows physicians to refer their patients to facilities that are treating breast density with the priority it deserves. One thing left out of the new guidance is how to reconcile the new notification laws with the patchwork legislation in place at the state level. Some states have no laws related to breast density notification, so this new rule from the FDA would clearly overtake that. But what about states that already have slightly different rules, or those whose laws are even more stringent than what’s being outlined by the FDA? It remains to be seen what will happen, but our recommendation is always to be cautious. If you’re in a state with strict breast density notification laws, those that go beyond the FDA rule, then opt for the stricter interpretation. Not only is notifying your patient of their breast density and having conversations about what’s next a good idea from a legal standpoint, but it’s also the right thing to do for your patients’ health. There are a few more takeaways for healthcare providers. First, the FDA is clear that they’re coming down hard on providers that continue to avoid having a conversation about breast density. Because they’re not shy about telling physicians and patients alike when a facility is not up to par, this could shift volume dramatically and create revenue loss for these organizations. A second, somewhat unspoken aspect of the new rule, however, has to do with the specific type of mammogram being conducted. It’s important to note that the FDA isn’t actually requiring additional testing beyond the initial mammogram. What they’re requiring is that the patient be informed if they’re discovered to have dense breasts and to speak with their physician if so. But that also means there will suddenly be an influx of patients found to have dense breasts who will be asking, “What now?” You will direct them to additional exams, likely in the form of a breast ultrasound to help see through dense breast tissue, identify malignancies and separate them from more benign lesions and other masses. Clearly, it’s in providers’ best interest—both financially and ethically—to pursue technologies that assess relative density but then actually aid in the diagnosis of cancer in a non-invasive way, one that doesn’t necessarily require a biopsy. For providers, I know it seems like the goalposts for what’s considered an acceptable test are moved all the time, but this one is win-win for both providers and patients when you consider the array of tests likely to be performed and the positive impact it can have on women’s health and your own revenue. 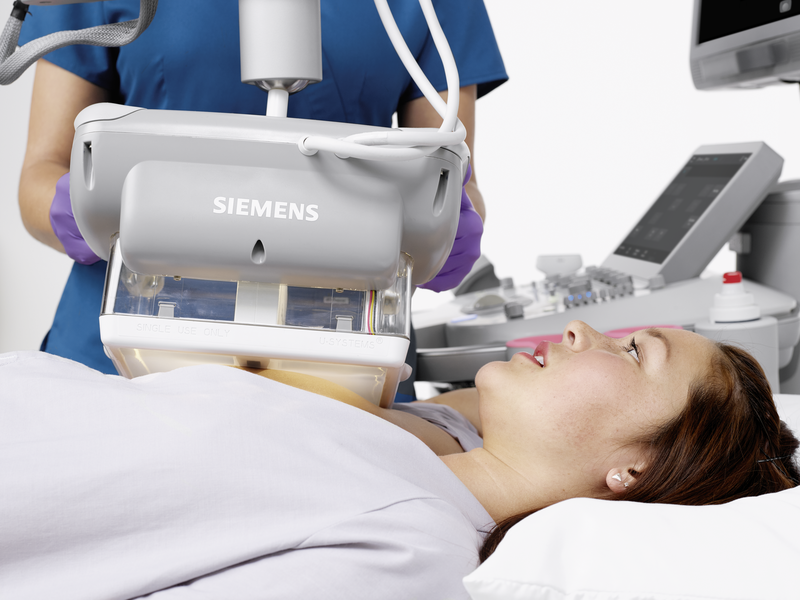 We have a variety of solutions to help you, including the popular 3D Total Breast Ultrasound that’s available on the ACUSON S2000 Automated Breast Volume Scanner, or ABVS, by Siemens Healthineers. 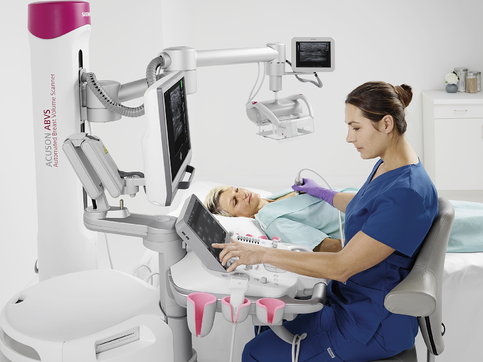 This technology is critical for accurately assessing breast density and the relative risk of cancer, as it provides standardized 3D imaging in the form of a coronal view of the breast that distinguishes between dense structures and normal breast tissue. For the first time ever, breast density is getting the national spotlight it deserves. I recommend all providers evaluate their current setup to determine if they’re on the right track for notifications related to breast density. You should also explore whether or not the time is right to increase the types of exams you’re able to offer in order to keep that business within your clinic or facility rather than being forced to stand by as physicians within your referral base send patients to get those tests elsewhere. Please reach out if you have any questions about the new law, breast density testing, mammography or 3D ultrasound technologies.